I was in Kuwait in 1991. 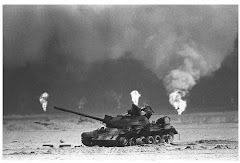 The first Gulf war had just finished, but the oil wells were still burning. To get into the country, I had to go to Saudi Arabia and hire a four-wheel drive the colour of the sand - because that was the colour of the US army vehicles. Then, to cross the border, someone told me to find a card in the same sort of colours as a US army ID card and wave it upside-down. Nobody stopped me, and I got through. What was incredible inside Kuwait was the sense of being in this huge theatre the size of the planet, with these oil wells burning all around. Sometimes you would go two or three days without any sunlight getting through the vast clouds of black smoke, then suddenly the sky would open. It was also quite dangerous. There were unexploded cluster bombs in the sand. A journalist and a photographer were killed when a slick of oil ignited as they crossed it. This photograph comes from a series of pictures I made with a group of specialist firefighters from Canada, who were trying to deal with a blazing oil well. Putting out the fire took days and days, but that wasn't the biggest problem, even though they then had to light another smaller fire, so that a lake of oil did not accumulate around them. 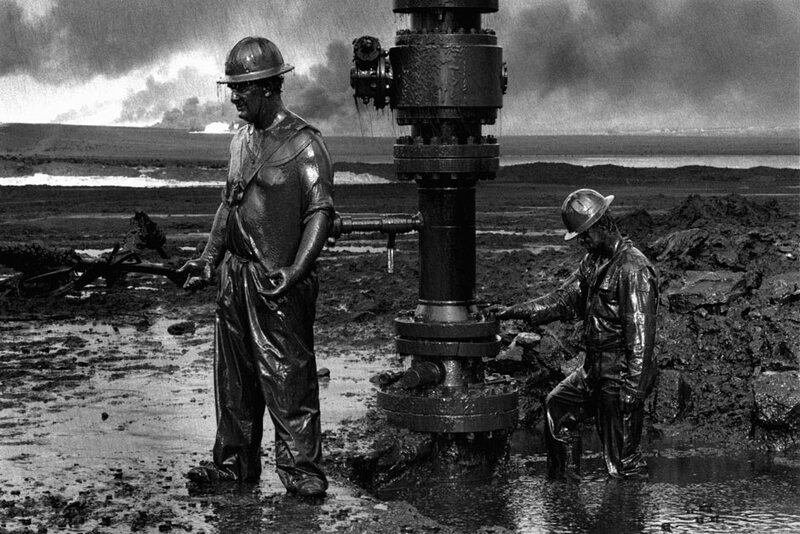 It was capping the well, for these guys, that was hell. Saddam Hussein's men had used a large number of explosives, leaving the wellhead badly deformed. Because Kuwait is at the lowest point of a vast Middle Eastern oil field, the pressure was enormous, pushing the oil out with a noise like a 747's engines. Everything was completely black. You couldn't hear anyone speak. 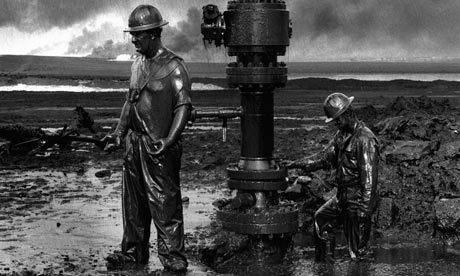 It was an incredibly dangerous place to work, because the oil was very light, much like the fuel in cars - so it catches fire very quickly, and its smell is very strong. At one point, one of the Canadians got too close, inhaled too much gas, and fell down unconscious. Meanwhile, as these guys worked away with their tools and instruments, they knew that if they touched metal against metal hard enough to create a spark, a fire would have engulfed them. As I was photographing, we did sometimes have a kind of explosion, as gas burst up through the well, but it did not ignite. The firefighters were making a lot of money, of course, but the work was so tiring and so tough that a few times I saw some of them just sit down and cry. Working in the middle of all this was extraordinary. One of my lenses got warped by the heat, so I was left with just two: a 35mm and a 60mm. This obliged me to stay very close to these guys the whole time. As a result, I was covered in oil, and felt so involved with the danger, the environment, the strange beauty and the hard work that was happening in front of me. The only way I could keep going was to carry a two-litre tank of petrol and a roll of kitchen paper inside my photo bag. I would put some petrol on the kitchen roll, clean my hands, the lens and the back of the camera, then go in again. Eventually, I felt part of the team, working with them for many days. We all became very close. I knew it would be good. At the same time, I was very afraid. My mouth was dry. That evening, when I got back to my hotel in Kuwait City, I found my jaw was tense and my gums were in pain from gritting my teeth all day long. But I had to be there to take these pictures. I knew I was witnessing powerful, extraordinary things that would not happen again. Studied: "I am a former economist. I never went to photography school to learn photography." Inspirations: "Bill Brandt was an incredible photographer. The many different studies he did in England - miners, nudes, life during the second world war - were important to me." High point: "When I was starting out, when I put aside my career as an economist. I looked at every book, went to every show, did my first stories, developed my first films. A fabulous time." Pet hate: "Photography has become a small world with so many jealous people. You do a story and then a lot of people try to do the same thing." Published at ProHealth today: At 11:00 AM London time on May 28, 2009, ME/CFS researcher Dr. Kenny De Meirleir, MD, PhD, spoke at a press conference unveiling his team's groundbreaking findings regarding the illness called Myalgic Encephalomyelitis / Chronic Fatigue Syndrome (ME/CFS). The presentation covered the team's conclusions regarding the complex mechanisms of ME/CFS pathogenesis, a diagnostic test, and directions for therapeutic strategies. To view the slides Dr. De Meirleir used in his press conference, go to http://www.mefmaction.net/Portals/0/docs//CFSDeMeirleir.pdf. WASHINGTON (Army News Service, May 27, 2009) -- Research completed and analyzed over the past year has narrowed the underlying causes of Gulf War Syndrome to three factors. For 18 years, researchers struggled to pinpoint the causes of Gulf War Syndrome and its wide-ranging symptoms. Then last year, a group of researchers under the U.S. Army Medical Research and Materiel Command and the Congressionally Directed Medical Research Program narrowed the primary causes to three: chemical nerve agents, pesticides, and the use of Pyridostigmine Bromide pills. A report titled Gulf War Illness and the Health of Gulf War Veterans was released by the Department of Veteran's Affairs in November 2008, consolidating all research on the syndrome to date. "There is definitely something different that has happened to servicemembers during the Gulf War as opposed to what is happening to Soldiers now," said retired Col. Melissa Forsythe, program manager of the Congressionally Directed Medical Research Program. "Today's Soldiers don't exhibit any of the same symptoms," Forsythe said. "We're talking about the same geographical region. So what happened to these servicemembers in 1990-91 that's not happening now? That's really the central question." Chemical nerve agents, PB, and many of the pesticides to which Gulf War veterans were exposed belong to a class of chemicals called Acetylcholinesterase inhibitors. These chemicals inactivate the enzyme Acetylcholinesterase, which is essential for breaking down the neurotransmitter chemical acetylcholine - a chemical which affects numerous bodily functions, according to the report. Forsythe believes a mixture of the three items above in combination with vaccines given to Gulf War servicemembers can't be ruled out as a possible cause for Gulf War Syndrome. The acute symptoms of excess exposure to Acetylcholinesterase inhibitors results in increased salivation and respiratory secretions, nausea, abdominal cramping, diarrhea, excess sweating, increased heart rate, and blood pressure. Other side effects can include muscle twitching, cramps, weakness, tremors, paralysis, fatigue, mental confusion, headache, poor concentration, and general weakness. At sufficient doses, exposure to Acetylcholinesterase inhibiting chemicals can result in respiratory arrest and death. Many of these side effects coincide with those of GWS. Typically, Gulf War veterans exhibit a number of symptoms including chronic headaches, widespread diffused pain that moves to different parts of the body, fatigue, gastrointestinal problems, cognitive difficulties, skin rashes, and respiratory problems, said Forsythe. Because of the wide range of symptoms, a diagnosis of GWS could be likened to finding a needle in a haystack, Forsythe said. There is no one test that will yield a definitive diagnosis for this illness that affects 25-32 percent of Gulf War veterans, she said, adding that the only way to diagnose the disease is to eliminate all other diseases with similar symptoms. Today's GWS research focuses primarily on diagnosis and treatment rather than a single cure. Studies focusing on the physical differences between ill and healthy Gulf War veterans may make a diagnosis easier and provide a much needed legitimacy to the illness. "At first, servicemembers were told that the illness was all in their heads. So now, it's very validating for those servicemembers to see that there are real physical differences between themselves and the Gulf War Veterans that are not ill," said Forsythe. Other GWS studies by the CDMRP include: research looking into the over-the-counter herbal supplement Co-enzyme Q10; the drug methylpristine, which may help with cognitive problems; and plans to look at self medications that Gulf War veterans have used and whether or not those were effective. Acupuncture is also being looked at for possible funding. Currently, the only relief for GWS sufferers is to prescribe treatments for their individual symptoms, said Forsythe. Unfortunately, record keeping practices during the Gulf War were not equal to today's standards, said Forsythe. Records on the use of Pyridostigmine Bromide and pesticides in theatre are virtually nonexistent. PB had been approved, since 1955, for treatment of myasthenia gravis, a muscular disease. During the Gulf War, PB was not licensed for protection against chemical nerve agents by the U.S. Food and Drug Administration, but it was authorized by the FDA to be released to Soldiers in combat as an "investigational new drug" as a nerve agent pretreatment. PB is now FDA approved as an effective pretreatment exclusively for the nerve agent soman and it is still issued to Soldiers for that purpose. Pesticides are still used in theater, however, only a handful of those pesticides linked to GWS in the report are still in the Department of Defense's pest control inventory. "Research is not necessarily fast, but is our best route in terms of helping people," said Forsythe. We know that people are out there suffering and they're trying to find their own remedies for symptoms. So our program, being focused on improving the diagnosis and treatments, is trying to get at the two prongs that can best serve those veterans who are ill."
(91outcomes.blogspot.com) -- Recent news stories highlighted a 2005 study by Dr. Han Kang that showed significantly increased rates of unexplained multi-symptom illness among deployed veterans of the 1991 Gulf War. Increased rates of death by motor vehicle accident. Additionally, another important 2005 study by Dr. Kang and her research team had findings that "contradict the prevailing notion that perceived exposure to chemical warfare agents should be considered an important cause of morbidity [illness and disease] among Gulf War veterans." Veterans of the 1991 Gulf War have been too ill, and for too long already. Effective treatments for the underlying illness have yet to be found or implemented. Change is needed -- desperately. (91outcomes.blogspot.com) -- In a stunning discovery reported here at 91outcomes first, Dr. Lawrence Deyton, Chief Public Health and Environmental Hazards Officer in the Veterans Health Administration of the U.S. Department of Veterans Affairs (VA) recycled large portions of his Congressional testimony this week from testimony he gave to Congress nearly two years ago, on July 26, 2007. This week's May 19th, 2009 hearing was a critical review by the powerful House Veterans' Affairs Committtee's Subcommittee on Oversight and Investigations, entitled Gulf War Illness Research: Is Enough Being Done? Despite appearing with two other highly paid VA bureaucrats -- including Mark Brown, who not surprisingly also appeared with Deyton at the July 2007 Congressional hearing -- no one at VA apparently wanted to bother with writing much new for Deyton's testimony except filler justification on VA's traditional and by law reliance on the Institute of Medicine "for independent and credible reviews." Whole paragraphs from the 2007 testimony were recyled into Deyton's testimony on Tuesday. From countless veterans' accounts, there are literally thousands of employees within VA dedicated to the VA's mission of serving those have borne the battle and their loved ones, particularly at the VA medical centers and clinics across the country. Yet, it is no wonder that VA health care providers have no new treatments to offer the 175,000 to 210,000 ill Gulf War veterans when the the callous indifference of VA officials in Washington like Lawrence Deyton can't even find new words to describe his work unit's lack of new findings that might help these ill veterans. Ironically, one of the new statments in the closing comments of Deyton's testimony this week was, "VA is an evolving organization that operates in a rapidly changing environment." Apparently that didn't apply to his own testimony, indicative of the lack of change of his work unit during the last two decades, which is still without treatments, answers, or information for ill Gulf War veterans, their health care providers, and their families. (91outcomes.blogspot.com) -- Army veteran Paul Sullivan of San Antonio, Texas gave perhaps the clearest answer to the question posed by Tuesday’s Congressional hearing, Gulf War Illness Research: Is Enough Being Done? “As an ill Gulf War veteran who has worked on this issue for 17 years both inside and outside government, the answer is no,” testified Sullivan, Executive Director of Veterans for Common Sense, former Executive Director and co-founder of the National Gulf War Resource Center, and a former VA employee in VA's Data Management Office. “In the past, we have seen service-related illnesses ignored, misunderstood, or swept under the rug,” said Subcommittee Chairman Harry Mitchell (D-Ariz.) in his opening statement. Dr. Roberta White, Ph.D., who has been researching Gulf War veterans’ illnesses since 1993, stated for the record that her team found not only low rates of PTSD among ill veterans, but also “systematic relationships,” between, “self-reported exposures to pesticides and to nerve gas agents and health complaints in specific body systems.” This early research was later validated by other research efforts. White’s team also found decreased white matter in the brains of ill Gulf War veterans, cognitive and neuropsychological deficits not explained by psychiatric diagnoses, and that ill Gulf War veterans’ health complaints remained stable and without improvement over time – no surprise to ill Gulf War veterans. White is the current scientific director of the Congressionally chartered Federal Research Advisory Committee on Gulf War Veterans’ Illnesses. Later in the hearing, when federal agency officials implied there was nothing wrong with Gulf War veterans, one Congressman pointedly asked, “What about Bunker?” Bunker had become a visible symbol of what has been and continues to be wrong with between 175,000 and 210,000 veterans from among the 696,842 who served in the 1991 Gulf War. Meanwhile, a CIA official testified regarding the 1991 Gulf War theater of operations chemical agent releases known to the agency. He failed to mention incidents known to the Pentagon or described by veterans to Congress in Congressional hearings over the past two decades, relying purely on what CIA “knew”. He showed little knowledge of ground conditions, during which chemical alarms – when used – continuously went off. He failed to mention chemical agent releases and exposures known to veterans and some within the Pentagon at the time that occurred in al Jubayl and Ra’s al-Mishab, chemical minefields in southeastern Kuwait, blister agent releases that caused the rapid Iraqi evacuation of a unit’s bunker complex in north-eastern Kuwait, and countless others like the incident Bunker described that personally affected him. VA, predictably, recycled old testimony from a previous Congressional hearing, suggesting that VA has done everything possible to help Gulf War veterans, who do not suffer from a “unique illness.” Predictably, Dr. Lawrence Deyton stated that VA would wait until 2010 for an Institute of Medicine (IOM) review of the November 2008 report of the Research Advisory Committee (RAC) on Gulf War Veterans’ Illnesses. The RAC’s findings were covered in detail by Dr. Lea Steele, Ph.D., of the University of Kansas, who passionately and compassionately presented the report’s findings during the Hearing. Oddly, in his testimony the Department of Defense official claimed credit for funding recent research years focused on treatments for ill Gulf War veterans – an irony given DoD’s enduring opposition to the funding as DoD officials have reportedly made clear to House Defense Appropriations staffers. Due to powerful support from Gulf War veterans' advocates, Congress has provided annual funding to DoD anyway, and it falls under the well-run Congressionally Directed Medical Research Program (CDMRP) based at Ft. Detrick, Maryland. The Congressional funding has been provided with clear instructions to DoD on its possible uses, with requirements to focus on treatments and prohibitions against more unneeded DoD research on stress and psychological causes for ill Gulf War veterans’ all too real array of symptom clusters. In short, veterans and science are in full agreement that the Gulf War’s veritable toxic soup made between 175,000 and 210,000 Gulf War veterans ill with chronic, multi-symptom illness, that their illnesses have not improved over time, and that effective treatments still do not exist – in large part due to long-term failures by the federal agencies charged with caring for ensuring the well-being of these veterans. And the federal response? CIA officials are still blindly and wrongly claiming there were few or no chemical releases that reached Gulf War troops, DoD officials are overly proud of the “lessons learned” from the Gulf War while Gulf War veterans continue to suffer, and the same low-level VA officials providing the same recycled testimony are still implying or outright stating that everything that could be done for Gulf War veterans was and is being done. Tell that to Jim Bunker as he, like tens of thousands of other ill Gulf War veterans, struggles with walking, sleeping, and communicating. All might be well safe with the Beltway in the Land of Washington. But all is certainly not well for the 175,000 to 210,000 Gulf War veterans who still continue to suffer the lingering, untreated outcomes of their Gulf War service. Change is needed – desperately. The Pentagon and Department of Veterans Affairs say an Institute of Medicine study shows there is no Gulf War “syndrome,” and that there is nothing unique about the symptoms 1 in 4 Desert Storm veterans suffer. But the congressionally mandated Research Advisory Committee on Gulf War Illness say that not only is there a series of symptoms that make up a definable illness, they know what caused that illness. Those opposing views were on full display May 19 in the first of three congressional hearings about Gulf War Illness. “We do believe that Gulf War illnesses are real — but there is no unique set of symptoms,” said Craig Postlewaite, deputy director of force readiness and health assurance under the assistant secretary of defense for health affairs. He based that view on the IOM study that concluded veterans’ symptoms vary too much to be seen as unique and recommended no more epidemiological studies. “We feel like their assessment is complete,” Postlewaite told the House Committee on Veterans’ Affairs’ subcommittee on oversight and investigations. She said the research shows that veterans who took the most pyridostigmine bromide — anti-nerve-agent pills — and used the most insect repellent, including flea collars, were most likely to suffer from the cluster of symptoms of known as Gulf War illness. Victims of the sarin gas attacks in Tokyo as well as animal studies produced the same cluster of symptoms, she said. The pills, pesticides and nerve agent are similar chemicals, so it appears that troops essentially overdosed. James Bunker, who served as an artillery officer in the war, provided an example of why. Bunker had a history of rushing through high school in three years, a great love of chess and an aptitude for math. But during the hearing, he stumbled over words and a piece of paper in his hands shook as he read his testimony. He no longer plays chess because he lacks the cognitive ability to plan out his moves. After deploying with the 5th Field Artillery Regiment, he said his unit’s chemical alarms sounded. Soon after, he developed breathing problems, muscle twitches, leg cramps, vomiting and convulsing. He was given an antidote for nerve agent and sent home to a hospital. Now, he has nerve problems in his right leg and has lost the use of his right arm. He suffers headaches, cognitive dysfunction, gastric reflux disease, fibromyalgia, mouth sores, skin rashes and sinusitis. Paul Sullivan, executive director of Veterans for Common Sense, said sick veterans want to know why they’re sick, where they can get treatment, and that their healthcare and benefits will be paid for by the country that sent them to war. “VA should publicly recognize our illnesses,” he said. Sullivan asked that VA be investigated to see if the IOM study was properly conducted. Congress mandated that study, but VA limited its scope to exclude animal studies and research where exposure dosage was unknown. That defines much of the available research; no one kept track of how much anti-nerve agent troops took or measured the amount of sarin they were exposed to when the military blew up a massive Iraqi chemical depot just after the 1991 war, making it impossible to document exposure dosages. In its work, the Gulf War illness advisory committee did include animal studies and research where the dosage was unknown. Steele said about half of troops who deployed for the 1991 war took anti-nerve agent pills and used personal pesticides such as DEET, and were also exposed to sarin. “We have no indication that any of them experienced any acute symptoms of exposure,” Postlewaite said. “What about Bunker?” asked Rep. Phil Roe, R-Tenn.
“As you know, there are many reasons for seizures,” Postlewaite said, noting that current troops would again be given anti-nerve agent pills if battlefield commanders determined a need for them. Sullivan also asked for training so VA doctors would be familiar with Gulf War illness — and that they be told it’s not a mental health condition. Richard Weidman, executive director for policy and government affairs for Vietnam Veterans of America, asked that the government keep track of where current service members are located in the combat zones, and that VA include in their medical records a query of where veterans were located when they were deployed. As it stands, there’s no way to look for patterns, he said. For example, if 30 veterans who all served in Baghdad develop brain cancer, VA would have no way to know whether this was a group that might have been exposed to a particular toxin. “This is nuts,” Weidman said. And it’s almost impossible to spot if no one keeps track of who served where, he said. “If you don’t have the stats, you don’t have a problem,” Weidman said, implying that VA doesn’t want to know if there’s a problem. “We have been and continue to be very concerned about these veterans’ health issues,” insisted Lawrence Deyton, chief public health and environmental hazards officer for VA’s Veterans Health Administration. Deyton said Gulf War veterans experience symptoms at a rate 25 percent higher than veterans of that era who did not deploy. But he acknowledged that VA could do better and said new VA Secretary Eric Shinseki has begin efforts to develop a simpler procedure for veterans to quickly and easily get benefits for service-connected ailments. Congress decided to hold the series of hearings because of the new reports from the IOM and the research advisory committee, as well as the change in VA leadership. Rep. Harry Mitchell, D-Ariz., chairman of the House Veterans’ Affairs oversight and investigations panel, said many questions still need to be answered. Washington, D.C. – On Tuesday, May 19, 2009, the House Veterans’ Affairs Oversight and Investigations Subcommittee, led by Chairman Harry Mitchell (D-AZ), conducted the first of a series of hearings on Gulf War Illness research. The hearing provided a review of the history of the research that has been conducted on Gulf War Illness, examined the methodology used by the Department of Veterans Affairs (VA) to determine possible exposure to toxins and pesticides, and focused on the ongoing challenges veterans face as a result of their service in Operations Desert Shield and Desert Storm. According to Congressional testimony, VA had concerns that returning veterans might have certain unique health problems including respiratory effects from exposure to the intense oil fire smoke even before the 1991 Gulf War cease-fire. During the summer of 1993, U.S. troops’ exposure to chemical warfare (CW) agents first became an issue. The Department of Defense (DoD) and the Central Intelligence Agency (CIA) concluded that no troops had been exposed for two reasons: there were no forward-deployed CW agent munitions, and plumes of CW agents released from the bombing that destroyed the chemical facilities could not have reached the troops. 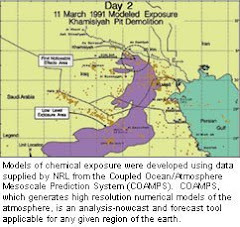 This conclusion was maintained until June 1996, when DoD publicly acknowledged that U.S. troops had destroyed stockpiles of chemical munitions at Khamisiyah after the war. In 1998, Congress passed legislation, the Persian Gulf War Veterans Act of 1998 and the Veterans Programs Enhancement Act of 1998, which directed the VA Secretary to seek to enter into an agreement with the National Academy of Sciences (NAS) to review and evaluate the available scientific evidence regarding associations between illnesses and exposure to toxic agents, environmental or wartime hazards, or preventive medicines or vaccines to which service members may have been exposed during service in the Persian Gulf during the Persian Gulf War. Congress directed the NAS to identify agents, hazards, medicines, and vaccines to which service members may have been exposed during the Persian Gulf War. Between January 1, 2000 and September 12, 2006, NAS issued four reports on health effects of various toxins, chemical warfare agents, and insecticides. Each report concluded that the available evidence did not warrant a presumption of service connection for any disease discussed in the report. The fifth report, released October 16, 2006, reviewed published, peer-reviewed scientific and medical literature on long-term health effects from infectious diseases associated with Southwest Asia. VA is currently drafting a proposed rule to establish presumptive service connection for nine infectious diseases discussed in the report and providing guidance regarding long-term health effects associated with those diseases. It was determined, however, that the scientific evidence in the report does not warrant a presumption of service connection for any illnesses caused by these diseases or agents. Veterans raised a number of concerns at the hearing, mostly based on lack of information, outreach, and resources available from the VA. Veterans reported frustration that there is no formal Gulf War I Registry, no service-connected benefits for maladies, inadequate research to determine the cause of illness, no formal recognition by the VA of Gulf War Illness, and a lack of epidemiological tools in use to further track effects of Operation Desert Storm and Operation Desert Shield. Subsequent hearings on this issue will take a multi-level view of the methodology and conclusions of Gulf War Illness research, how the review of information was compiled, and why certain methods were employed.